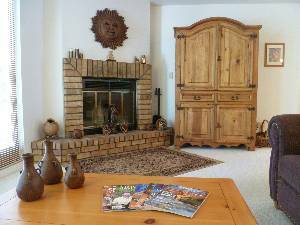 Charming and comfortable home-base for exploring Sedona, Arizona. Located on the Oakcreek Country Club golf course, with green tranquil views - a great golf vacation getaway destination. Sedona, Arizona is a great family-friendly golf vacation destination! -2 bedroom, 2 bath duplex home: Side B-1100 sf. -Wi-Fi wireless high-speed internet access. -Living room with wood fireplace. -27" flat screened TV with DVD player. 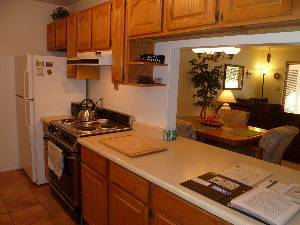 -Full kitchen with all appliances, quality stainless steel pots, and gadgets. -Master bedroom with pillow-top queen bed, LCD TV, and master bath attached. -Second bedroom with Tempur-Pedic foam queen bed and adjacent bath. -Board games, books, and cards. Small DVD and CD library. -Golf course view from covered patio, with gas barbecue. 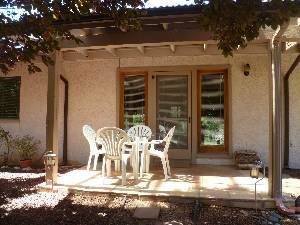 -Ground level for both, with single carport parking. -Natural cleaning products are used. -"Bella Diosa" means Beautiful Goddess. The Red Rock Pass is included during your stay! Plus we offer an 'orientation' to Sedona, Arizona - maps, menus, and flyers! 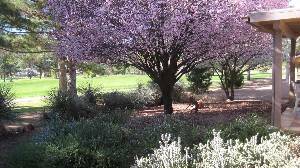 Golfing in Sedona, Arizona is some of the finest in the country - plan your golf vacation today! A few Games & DVD's are also supplied. The Red Rock Pass is included during your stay! Plus we offer an 'orientation' to Sedona, maps, menus, and flyers! At right side of Living Room. At left side of Living Room. With pass-through. Left side of Kitchen with Laundry Closet not shown. July 15, 2015 Reviewer: Janet C.
Don't miss this one! Bella Diosa is an example of all of the reasons we love to visit Sedona! The beauty, peace, clarity and graciousness of the owners and the home space reflect the best of the region. Jeff and Aria have created an oasis away from the busyness and crowds. Bella Diosa is a beautiful vortex of its own. The proximity to Bell Rock (in a few minutes you are on the trail!) combines with the peaceful, comfortable and centered environment within the home. From the bedrooms, bathrooms, kitchens, and open, airy living space there is an easy, peaceful grace and comfort. All of the amenities and more are available - including the well stocked kitchen and laundry! Beds are very comfortable! The outdoor seating is ample and comfortable and right on the natural beauty of the golf course. Bird feeders on property will delight bird enthusiasts as well! Aria and Jeff are gracious (but not intrusive) hosts who provide guests with lots of information about local sites, events, opportunities. They even share the national park pass! We look forward to many more adventures at Bella Diosa! This was a wonderful home for a week. Three of us stayed here very comfortably. The home is warm, welcoming and easy to get to and from. A annual pass into the parks was a nice touch. How terrific to have found Bella Diosa. Perfectly located in Oak Creek (Sedona). Thanks for your thoughtful, useful tips for in and around the Red Rock area! Your home feels so comfortable and was so easy to slip into from Day 1. I have stayed in many vacation rentals, but Bella Diosa by far has been the best. I have been to Sedona 4 times, and each time stayed at Bella Diosa. It is like my 2nd home. You might say my home away from home. Located on the Oak Creek Country Club, the view from the patio is beautiful. Very relaxing. The kitchen is well equipped with everything you need for cooking. 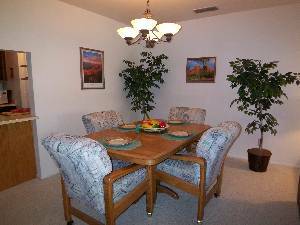 The dining and living room areas are very spacious. The beds are comfortable for a good nights sleep.The information packet that is supplied by the owners, has everything you need to know about where to eat, shop, and sights to see. You definitely will feel at home at Bella Diosa. Words cannot describe the wonders of Sedona -- it is drop dead gorgeous -- and this lovely home certainly added to my family's enjoyment. 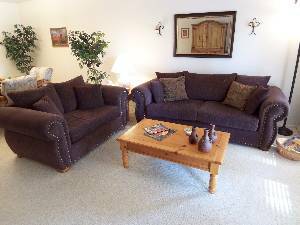 It is immaculate, and decorated with taste and whimsy; has extremely comfortable beds and cushy couches; strong wi-fi connection; and has a great TV/sound system. All this and a full kitchen and washer/dryer, too. We felt both pampered and at home immediately, with plenty of room to spread out and enjoy. Bella Diosa is located in a peaceful community with a golf course; you can eat your take-out meals (or grill if you are in the mood) on the patio, and with the golf course right there it appears that you have a huge back yard. Make sure to sit outside some night just to look at the stars - Arizona's clear skies make for awesome viewing. My experiences with the owner were all very positive. All questions answered promptly via e-mail or phone calls; Aria is a delightful person (and this house reflects her cheery personality. If I had unlimited vacation time, I would book this home for a very long time and be a very contented person. Run, don't walk, to book this if it is available - you'll thank yourself many times over. P.S. -- Make it a priority to take the Pink Jeep tour while you are in Sedona, and also make sides trips to Montezuma's Castle & well, as well as to Tuzigoot. June 18, 2008 Reviewer: Alyssa Santos From: Redondo Beach, Ca. I have stayed at Bella Diosa twice. The first time I stayed, I knew I would have to stay again. What a wonderful place to come back to after spending the day around Sedona. It is nicely decorated, smells wonderful and is so very clean. It feels like home. The energy is fabulous as well. My second stay was a three day getaway that I organized for 15 women. Although they all stayed close by at a hotel, we used Bella Diosa as our home point and gathered morning and night. Owners Jeff and Aria were gracious to all of us. I look forward to staying again soon. Notes and Terms: We have a "sliding rate" scale -- the longer you stay the less it is per night; the shorter, the more per night -- 3n $555, 4n $675, 5n $775, 6n and 7n $850 via check or money order to us; also add the $75 cleaning fee (the monthly cleaning fee is $190). For payment using PayPal to us, add the 3.9% fee. For holiday dates, add a premium of $50 for that day. Rates already include taxes! The above example daily rate of $157/n is for 5n's stay only (their system will not accommodate sliding rate scales). A Rental Agreement will be emailed to you. The Red Rock Pass is provided for your use. Sedona orientation with maps, menus, and flyers are provided in the green binder and armoire drawers. Rates are for 1 to 4 guests. Wisest to reserve your vacation NOW! Well-behaved children only please. Check-in time is 2pm and check-out time is 10am. For other arrival or departure times, arrangements must be made in advance. Until confirmed, rates are subject to change without notice. Deposit: 50% deposit reserves your requested time - held by credit card. Then mail your 50% check with the rental agreement. The balance is due 30 days before arrival. For short notice reservations, 100% is paid by credit card (Visa/MasterCard) or cashier's check. Cancellations and Refunds: Cancellations made within 90-60 days before check-in will be refunded less a $100 cancellation fee; within 60-30 days, less a $250 fee. Cancellations made within 30 days of check-in will be refunded only if the home is rented again within the same time period. Management shall make every effort to re-rent the premises in this event. Other Fees: No extra costs -- Cleaning Fee and Taxes are already included!